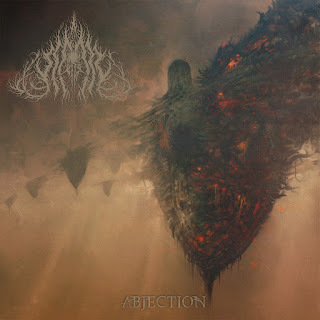 Embra are a band from Richmond, Virginia that plays an atmospheric mixture of black and death metal and this is a review of their 2018 album "Abjection" which will be released in December as a joint effort between Casus Belli Musica and Beverina. A very dark sounding intro starts off the album along with a great amount of atmospheric soundscapes and field recordings before going into more of a heavier and dissonant direction while the faster sections of the songs also add in a great amount of blast beats along with the vocals adding bestial death metal growls onto the recording. Throughout the recording you can also hear a great mixture of slow, mid paced and fast parts while black metal screams are also used quite a bit throughout the recording along with the tremolo picking also giving the songs more of a raw feeling as well as some atmospheric elements also being added into the heavier sections of the music, clean playing can also be heard briefly and half of the tracks are very long and epic in length and a small amount of melody can also be heard in the guitar riffing at times and as the album album progresses an instrumental is added onto the recording. Embra plays a musical style that takes a very atmospheric and dissonant form of black metal and mixes it with death metal to create a sound of their own, the production sounds very dark and heavy while the lyrics cover physical, mental, emotional and spiritual torment themes. In my opinion Embra are a very great sounding atmospheric mixture of black and death metal and if you are a fan of those musical genres, you should check out this band. RECOMMENDED TRACKS INCLUDE "Astral Cord Severance" and "Voidwelder". 8 out of 10.